White Deer Ranch is in Stillwater County. Stillwater County is rich with history of early Native Americans, pioneers and wagon trains. The Stillwater Valley is rich and fertile ground abound with wildlife and ideal for livestock and ranching. This beautiful country was hunting grounds to the Crow Indians. Evidence of their inhabitants can still be found in arrow heads, teepee rings and oral traditions. Early settlers traveling on the Bozeman trail came through this country and decided to call it home. The earliest account of settlement along the Stillwater River was in the late 1800's. The photo of the wagon to the right is from a re-enactment of the Bozeman Trail travelers. Part of the Trail may have even come through the ranch as it has always had ample water on it. The land which is now White Deer Ranch belonged to the Dave Hudson, one of four brothers that moved to the region in the late 1800's from Saginaw, Michigan. Several of the brothers waited until the reservation opened up for homestead in 1892. Some research about the early inhabitants of what is now White Deer Ranch was revealed in the text, They Gazed Upon the Beartooths, by Jim Annin, "Dave Hudson came to the family home in Saginaw, just before the Civil War started and came to Montana shortly after his brother, John, on a cattle drive. He was a cowhand for the "79" for a few years under Con Mendenhall's camp wagon, and also for stockmen on the Stillwater. In 1892, he located a ranch on the Stillwater, and later on Grove Creek. In 1894, at Columbus, he was united to Della Riddle whose parents came to the Stillwater Valley in 1893. The Hudson name was added to nine children, Roy, Clarence, Iva, Jesse, Eva, Ernie, Clara, Vina and Ida." The original Hudson home is still on the ranch. It started out the size of the present day kitchen. As the family grew to include 9 children the Hudsons added additional rooms to the house. It now has three bedrooms, all with hardwood floors, arched doorways, and a cobblestone decorated front porch. Dave Hudson died as a result of an accident in 1936. Mrs. Hudson died in 1956. Ernie, their son, continued to run the place until he sold it to Jerry Raglin in 1980. Jerry Raglin sold to Lee Dunn and Calvin Clark in 1989. The ranch was named White Deer Ranch after an albino deer that was on the place. The brand -WD was established. Lee Dunn and Calvin Clark originally owned 2,220 +/- acres in partnership, that was divided in two equal parcels for each family. After selling 600 acres of pasture, the Dunn's now own approximately 450 +/- acres where the original Hudson house and outbuildings are located. White Deer Ranch named for an albino deer doe and her fawn that were on the place when it was purchased in 1989. Native Americans were the first inhabitants of the area to become known as the state of Montana. The Lewis and Clark Expedition of 1804-1806 was the first group of white explorers to cross Montana. Trappers and traders followed the expeditions. On August 14, 1848, Congress created the Oregon Territory, an area that includes what is today Oregon, Idaho, Washington, and western Montana. 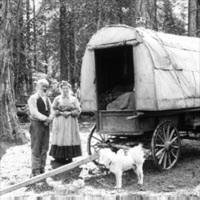 The Oregon Territory quickly became a popular place for various groups of immigrants and settlers. A cut-off, which provided a savings of several hundreds of miles was the Bozeman Trail. It was difficult and treacherous, but provided more water for livestock and saved time. Parts of the Bozeman trail can be traced very close to where the property of White Deer Ranch now sits. The discovery of gold brought many prospectors into the area in the 1860's, and Montana became a territory in 1864. As more and more settlers came into the area, Indians lost access to their traditional hunting grounds and conflicts grew. Eventually, the Indians would succumb to the power of the military and reservations were established. Cattle ranches began flourishing in western valleys during the 1860's as demand for beef in the new mining communities increased. During the 1880's railroads crossed Montana, and the territory became a state in 1889. Mining also began at this time. Butte became famous when silver and copper were discovered. Cattle and sheep ranches continued to take advantage of Montana's abundant grasslands. Passage of the Enlarged Homestead Act in 1909 brought tens of thousands of homestead farmers into the state looking for inexpensive land. This boom was followed by the great depression. World War II broke the hold of the Great Depression. The resultant wartime dislocation changed Montana forever. Post-war or "modern" Montana (1945-2000) has been characterized by a slow shift from an economy that relies on the extraction of natural resources to one that is service-based. Agriculture has remained Montana's primary industry throughout the era. After 1970 tourism supplanted mining as the state's second largest industry. The Hudson Family were homesteaders like these. They came to own their parcel of land in 1892 when the area opened up for homesteading after previously being reservation land for the Crow Indians.